Not in Vancouver, British Columbia? This activity has finished and is no longer running. Sweet dreams are made of pizza and chocolate on Valentine’s Day at Rocky Mountain Flatbread! 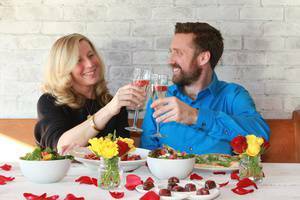 Chef Oliver Zulauf has created a delicious 3-course Valentine’s Day dinner menu with handmade raw chocolate pairings from Koko Monk Chocolates. Begin with the golden song of a Brunette Bangle (a curry and coconut infused chocolate) and choice of traditional salad (fig & goat cheese, basil & blackberry, or fresh herb salad), melt in your mouth BC mushroom caps, or house made soup. Pucker up your lips for your First Kiss (a to die for sour cherry and raspberry infused chocolate) and enjoy any hand-crafted Traditional Flatbread pizza or featured organic pasta made with seasonal veggies and local meats. Wind down your evening with dessert – your choice of the signature Rocky Mountain Flatbread warm double chocolate brownie, apple cinnamon crumble (vegan) or baked cheesecake with gluten free toasted coconut crust. This three-course menu is offered for $30 per person (plus tax and gratuity). Rocky’s Valentine’s Day Kids Menu comes paired with chocolate too! This three-course menu is offered for $13.50 per child (plus tax and gratuity). Call Rocky Mountain Flatbread Main Street at 604-566-9779 or email info@rockymountainflatbread.ca. Call Rocky Mountain Flatbread Kitsilano at 604-730-0321 or email info@rockymountainflatbread.ca. Stay up to date with committed parents and families! Weekly camps are designed to keep kids active and engaged! Summer Camp Registration is Now Available!